As time passes by, things start to break down and deteriorate. It doesn’t matter what it is, it will start to lose some of its natural shine. However, there are some operations which can be performed to bring things back to their original state. In the instance of chrome objects, you can use a chrome polish. Chrome polish is a paste-like substance which can be rubbed on, and buffed off of chrome objects so that they possess a reflective, shining look. This substance also typically operates as a rust remover and a deoxidizer as well. If you want your car bumpers or tire rims to look good as new, get yourself a quality chrome polish. 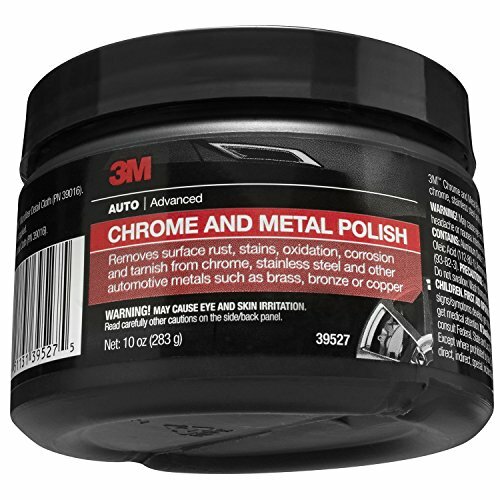 3M 39527 Chrome and Metal Polish - 10 oz. What Should You Think About When Choosing a Chrome Polish? The first chrome polish on our list is the 3M 39527 Chrome and Metal Polish. This is, in our estimation, the best chrome polish on the market today. It offers quite a bit in the ways of aesthetic and functionality. This polish comes in 10-ounce jars, and can be safely applied to everything from steel, to brass, to bronze, to copper, and of course, chrome as well. It works terrifically as a rust remover, an oxidation reducer, a corrosion dismisser, and a metal cleaner. All in all, this is an excellent chrome polish. It comes in the form of a paste, and can be easily spread on, and rubbed off. In the end, it leaves a glowing shine on everything from tire rims, to bumpers, and much, much more. It’s available for a mid-level price. 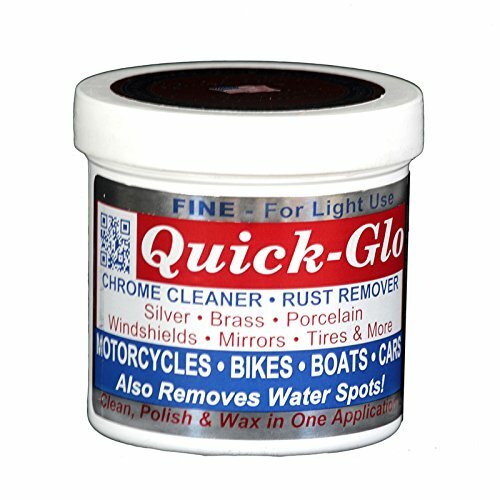 Next, let’s review the Quickway Quick Glo Chrome Cleaner. Available for a mid-level price, it provides both top-notch cleaning and maintenance properties. It’s right on par with the 3M polish reviewed above. This polish comes in jars of 10 ounces, giving you enough for a few applications, but not enough to use over a long period of time. It possesses a paste-like consistency which rubs on smooth, and which can be easily swiped off with a buffer or cloth. All in all, this chrome polish from Quickway is a terrific product. Not only does it provide chrome with a shine, it also helps to remove rust, reduce oxidation, and give items a fresh, new aesthetic. Now, let’s review this chrome polish from Surf City Garage. Coming in 8-ounce bottles, it’s available for a mid-level price. It’s very similar to the 3M and Quickway polishes reviewed above in that it offers exceptional rust-removing and cleaning capabilities. This polish possesses a viscous consistency, spreading on to polish with ease, but having enough solidity so that it doesn’t just pour directly off. It can be spread and and rubbed off with anything from a buffer, to a microfiber towel, and otherwise. Overall, this chrome polish from Surf City Garage is a terrific product. It’s not a paste polish like the ones reviewed above, but a liquid instead. 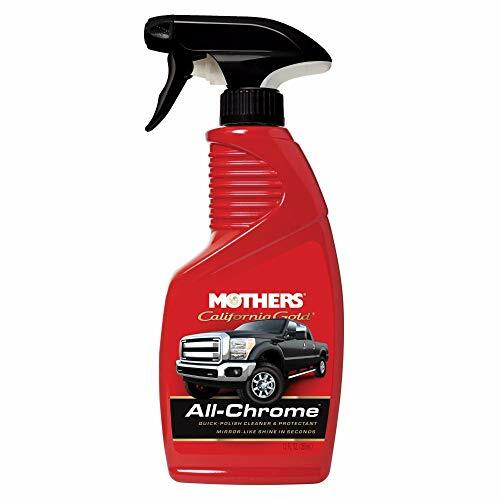 If you’re looking to bring a new shine to your bumpers or tire rims, this is a great product to do so with. If you’re looking for a terrific chrome polish that’s on the cheaper side, you might very well be interested in this one from Turtle Wax. Available for about half the price of the three previous polishes we reviewed, it comes in 12-ounce bottles. This polish possesses a thick, liquid consistency which spreads on rather smoothly compared to most pastes. For this reason, it can be used in an exceedingly quick manner. Just dab it on your towel, and then rub that towel across the chrome. All in all, this is a great budget product. It helps to remove rust, to reduce oxidation, and to give chrome a shiny, reflective look. It’s great for those who want to polish their chrome, but who don’t want to spend a great deal of money to do so. Next up on our list of chrome polishes is this polish from EZ Brite. Coming in jars of 7 ounces, it’s available for a mid-level price, and offers quite a bit in the ways of cleaning capabilities and overall functionality. 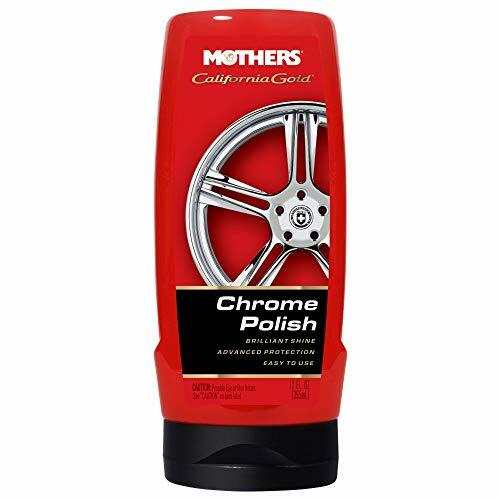 This polish possesses a paste-like consistency which can be spread fairly simply across everything from tire rims, to bumpers, and more. As an entirely biodegradable material, it’s healthy for the environment and safe for your chrome objects. All in all, EZ Brite Stainless Steel & Chrome Polish is a terrific product. If you’re looking for just a small jar of polish, it would be a great choice for you. It’s not quite on par with the first 4 polishes in our list, but still does a terrific job of derusting and deoxidizing metals. Coming in bottles of 12 ounces, it goes on smoothly without streaks, providing your chrome with a fresh appearance. It’s designed with synthetic polymers which work to stave off traces of fingerprints, rusting, and corrosion. It also does a terrific job of reducing oxidation. This enables it to handle tire rims, bumpers, and everything of the sort. Overall, this chrome polish from Mothers is a terrific budget buy. It can even be used to clean windows and glass. 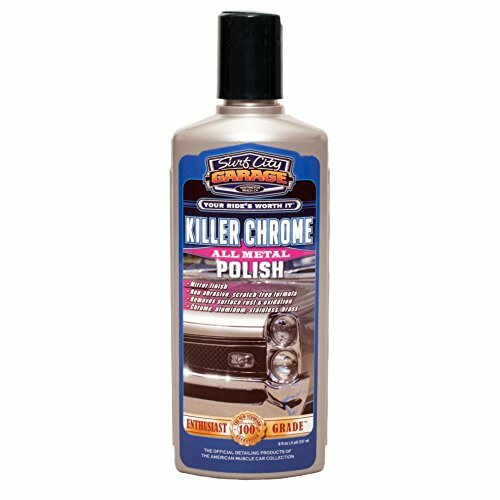 If you’re looking to polish your chrome for as cheaply as possible, this is the polish to use. Another solid mid-level chrome polish is this one from Cyclo. No7 can be used to polish metals of all different types, going out without smearing, and helping to reduce everything from rust, to oxidation, to corrosion, and more. This is a mostly liquid polish which spreads exceptionally easily. Rubbing it in with a buffer or a microfiber towel will help give chrome and other metals a gleaming, fresh look. It works terrifically for tire rims and bumpers. All in all, it’s a very solid chrome polish that will just get the job done. There are technically better chrome polishes on the market, but this one certainly isn’t a failure. Available for fairly reasonable price, it’s definitely worth a purchase. Up next is another chrome polish from Mothers. This one comes in a spray bottle and possesses a very liquid consistency. This allows it to be sprayed easily on a chrome object and rubbed in without leaving any streaks behind. This polish is more equipped as just a cleaning product. It doesn’t do a terrific job of removing rust or clearing oxidation stains, but can be used to give well-conditioned chrome a shiny, fresh look. This makes it best for relatively new items. All in all, it’s a solid, but not outstanding product. 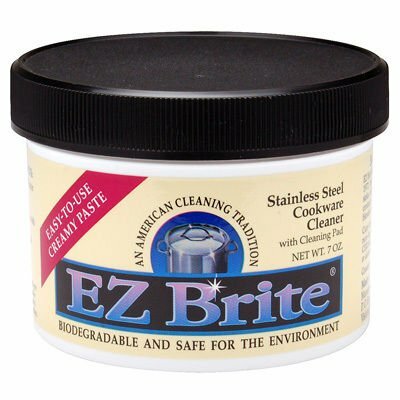 If you’re looking to get stains out of your metal items, you’d be better served by a higher-end polish; specifically a paste polish. This one, however, is available for a very reasonable price. 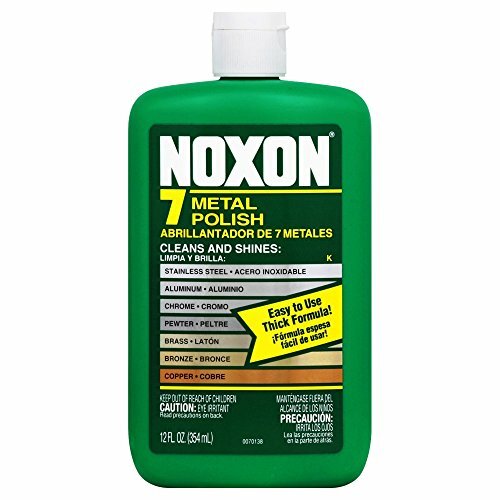 Another solid budget chrome polish is Reckitt Noxon 7 Liquid Metal Polish. This polish is very similar to the Mothers polish reviewed above in that it works more as a cleaner than a deruster or deoxidizer. It comes in a bottle of 12 ounces and possesses a sort of paste-like consistency. This consistency is strong, yet still very easy to spread from place to place with a buffer or microfiber mesh towel. It can be used on all types of metals, from stainless steel, to chrome, to bronze, and more. All in all, this is a good, not but spectacular chrome polish. If you’re seeking something that will reverse the effects of oxidation, you’ll have to look elsewhere. This will, however, do a solid job of shining up relatively spotless items. 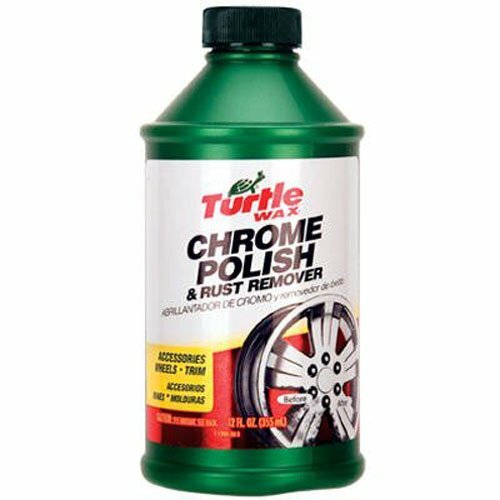 The last chrome polish we’ll review is this one from Turtle Wax. Available for a very reasonable price, it comes in bottles of 12 ounces. While it’s not the best chrome polish on the market today, it offers quite a bit in the ways of deoxidation and derusting. It possesses a thick, but spreadable paste consistency which is strong but still fairly easy to work with. Because of this, it does a good job of reducing oxidation, and of removing existing rust. It can be used on soft metals of all types, from chrome, to bronze, and otherwise. 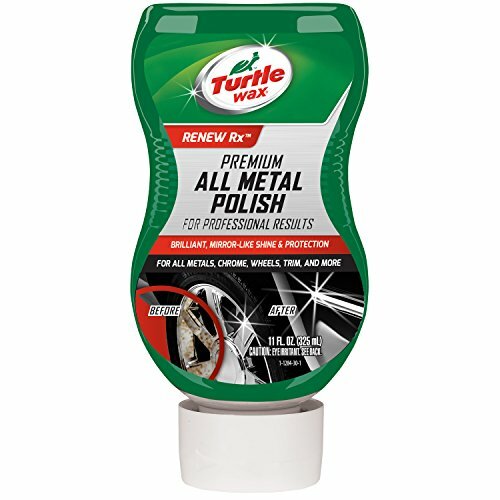 All in all, this Turtle Wax chrome polish is a terrific budget product. If you’re trying to remove rust and oxidation at a bargain, this is your best bet. It may not work for all purposes, but has been proven to work for many. When perusing chrome polishes, you may start to believe that they’re all about the same. However, there are a number of different things which separate one chrome polish from another chrome polish. By taking these things into consideration, you stand the best chance of buying the polish that’s best for you and your purposes. These things include volume, ingredients, functionality, and price. Chrome polishes comes in bottles and jars of all different sizes. Whereas some chrome polishes come in bottles of 60 ounces, others come in small jars of just 10 ounces. Try to estimate how often you’ll be using your polish before making a purchase. Obviously, if you use your polish often, you’ll be better served by a bigger jar. Another thing to consider when choosing a chrome polish is the ingredients contained within it. While some polishes are made with synthetic ingredients, others are made with all-natural ingredients. Though both are typically safe for your car, there are some synthetic polishes which can do some damage if you’re not careful. Some polishes can be easily spread on and rubbed back off. Others have to be worked in quite a bit. While you want your polish to have some solid consistency to it, it also needs to be fairly spreadable. The best chrome polish will typically have an almost paste-like consistency. As with any product you buy, price is something you need to consider when choosing a chrome polish. It’s wise to create a budget by setting a minimum cost and a maximum cost, and finding something that falls in between those two figures. There are tons of great polishes available for reasonable prices. There’s no reason to buy the farm.